When you want to make a big statement, a billboard is the way to go. With our services, our experienced graphic designers can help you create an image for your board and help you find a board to purchase. Call us today to see exactly how we can help you with this area of your campaign. Our mobile bill boards are a great way to grab attention at your location or others. With our 8 foot x 18 foot 2-sided bill boards you can put it anywhere that you want. Have a grand opening or a special event why not tell everyone that passes your shop about it. Have a clearance going on or a end of the year sale? Scream it with our mobile bill board. Everyone uses h-stake signs and flags to make offers, which has made it so people dont even read them anymore. Our billboard can be brought to your location and will grab attention. People are used to driving by regular billboards every day and since they are in the same location they dont even look at them after a while. Not a mobile billboard. When we bring this huge sign to your location everyone notices because it was not there the day before. If you have an event big enough that you want to draw attention give us a call and we will do the rest. In-house graphic designers work 1-on-1 with you to create the perfect design. The finished billboard is delivered to your location in a timely manner. 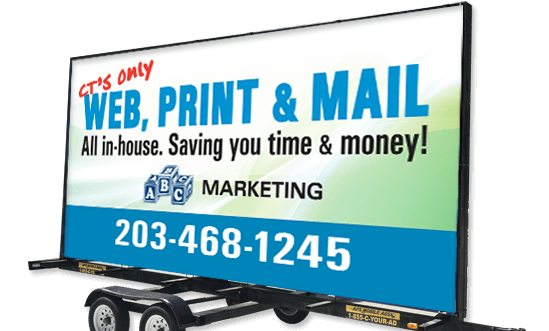 We mount your design then set up the mobile billboard on the spot!